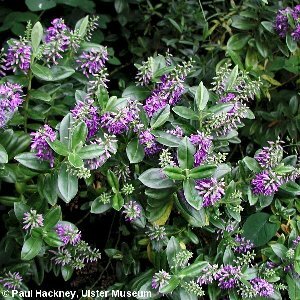 Along the coast of Northern Ireland this vigorous shrub (one of the so-called 'woody veronicas') with its thick oval leaves and spikes of brilliant blue flowers is common, locally abundant, in gardens and garden hedges. Although fertile, self-sown individuals are very rare and the plant cannot be described as generally naturalised. 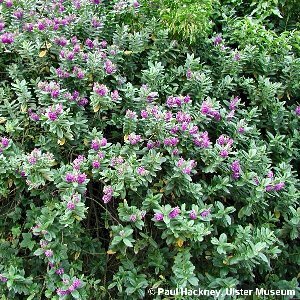 It is a hybrid of two New Zealand species and all our plants seem to belong to the selected variety called 'Blue Gem'.